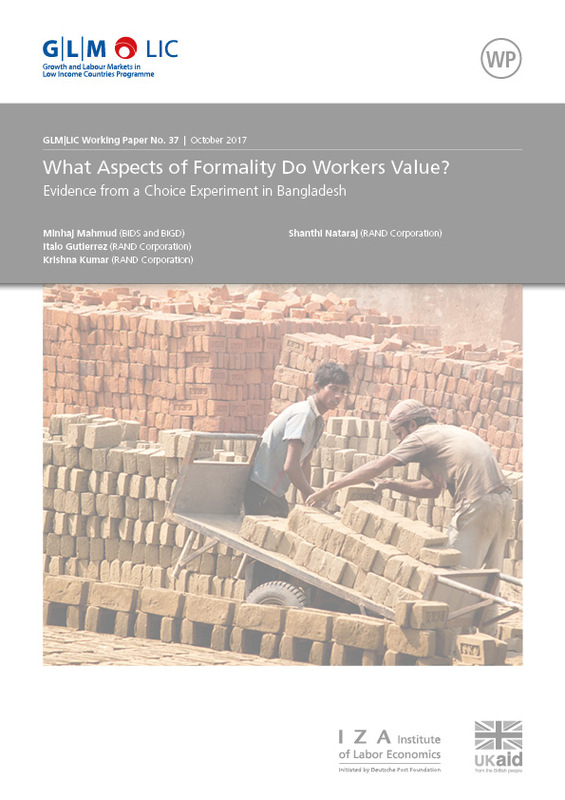 What Aspects of Formality Do Workers Value? In this study, we use a choice experiment to elicit workers’ willingness to pay (WTP) for specific job benefits typically associated with formal employment (contracts, termination notice, paid leave, preferred working hours, and access to a retirement account). We find that workers most value job stability: the average worker would be willing to give up 19 percent of monthly income for a 6-month contract, 27 percent for a 1-year contract and 44 percent for a permanent contract (relative to no contract). Thirty days’ of termination notice would also be valued at about 12 percent of monthly income. Using a latent class model, we explore preference heterogeneity and find that government workers are more likely to place a higher value on long-term contracts than private sector employees, while casual workers are more likely to have a particularly strong preference for higher salary, and a relatively low WTP for various benefits. This heterogeneity may be driven by sorting or loss aversion. Our work also lends support to the use of choice experiments to overcome the challenges associated with estimating WTP for specific job benefits from hedonic wage regressions or from observed job durations.